2018 Women's National Team member Megan Baltzell was named Sportswoman of the Year after her stellar performance in the 2018 World Baseball Softball Confederation (WBSC) Women's Baseball World Cup. 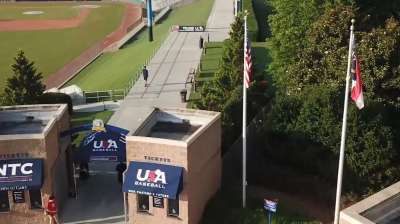 The USA Baseball Women's National Team ended its run at the 2018 World Baseball Softball Confederation (WBSC) Women's Baseball World Cup with a heartbreaking 8-5 loss to Canada in the bronze medal game on Friday at the USSSA Space Coast Complex in Viera, Florida. The USA Baseball Women's National Team finished off Super Round play in the 2018 World Baseball Softball Confederation (WBSC) Women's Baseball World Cup with a 8-1 defeat of Dominican Republic at the USSSA Space Coast Complex in Viera, Florida, on Thursday night. The USA Baseball Women's National Team dropped its first Super Round game in the 2018 World Baseball Softball Confederation (WBSC) Women's Baseball World Cup 3-0 to Japan on Tuesday night at the USSSA Space Coast Complex in Viera, Florida. The Women's National Team dropped a tough loss to Chinese Taipei 4-3 in its final opening round game of the 2018 World Baseball Softball Confederation (WBSC) Women's Baseball World Cup on Sunday at the USSSA Space Coast Complex in Viera, Florida. Defense and a Megan Baltzell home run were the highlights of the game on Saturday as the Women's National Team kept its perfect record in the 2018 World Baseball Softball Confederation (WBSC) Women's Baseball World Cup with a 3-1 victory over Venezuela at the USSSA Space Coast Complex in Viera, Fla.